Where did you see it? I've been looking for an EVA 3 CGI walkthrough. It was shown on NASA TV. Nice sunset view of the truss! 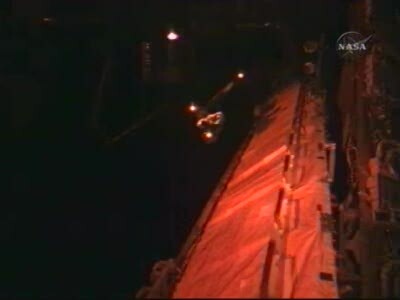 There was a nice view of Discovery's cockpit windows and the JLP a few moments ago. I'm not sure if it was from the JEM RMS camera, but it showed the SSRMS and the SRMS. It was from OBSS camera. The picture (vlcsnap-01822.jpg) shows that. "Port SARJ Update: Ground specialists believe the possible source of the grease-like substance observed by Fossum & Garan during EVA-2 in the portside Solar Alpha Joint is Braycote-601, a lubricant used in space, from the trundle bearings. Similar indications can be seen in imagery from the inspections performed during Mission 10A. A get-ahead task was added to tomorrow's EVA-3 to collect samples from the SARJ from debris on a tang, a second site for debris, debris mixed with grease, and the purest sample of the grease-like matter." They are going to disable the backlight on the front panel display. They need to remove the display, which means taking off the bottom cover, and removing a couple of switches that are in the way. On the display board they will snip the lead of a resistor to create an open circuit - this will stop current flowing in the backlight. Its lucky that the resistor in question is an "old school" leaded type (looks like it was a hand modification by the manufacturer) since the rest of the board is surface mount technology. Trying to remove a surface mount resistor would have not been possible without specialist tools. I agree it is lucky they could just snip a wire. Actually, removing SMT components like resistors is not too hard, although it does require a steady hand and a fine tipped soldering iron. (Do they have a soldering iron on station? That'd be fun...) But in general, you are right - for anything more complicated, you really do need a specialized heat gun. Yes - they do have a soldering gun on station.